Taxes, death and mobile data growth are three things that will continue until the end of time. There are a lot of forecasts on the latter, but let's keep the mathematics simple and say demand is growing at 50% compounded annually in dense urban centers -- the only places we're really concerned about. 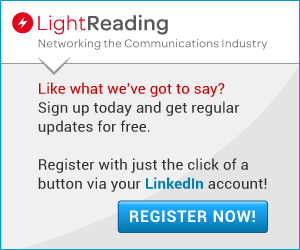 So, the question then is, how can operators build networks to meet that demand? There are a few ways. The first is by using existing spectrum more efficiently. The second is by using new spectrum. The third is through densification. Let's take a look at LTE. In LTE, the last great efficiency push comes from an antenna technology called massive MIMO (multiple input, multiple output). Deployment has already started, but we expect gains in throughput and capacity to come mainly in 2020 and beyond. In terms of new spectrum, three of the top four operators in the US will have no new licensed LTE spectrum from 2017-2020! Only T-Mobile US Inc. can draw on new 600MHz purchased in 2017. However, there are other options. Shared CBRS (3.5GHz GAA) should be available in 2019 and unlicensed 5GHz (WiFi spectrum) is now an option through the use of Licensed Assisted Access (LAA) technology. Densification, the third capacity technique, unfortunately can result in unwanted interference if applied more so than has already been done in the same frequencies, and so we expect its use to be limited. So, what does all this mean? From our forecasts, we see LTE hitting a wall. The wall appears around 2022 or so and shifts a year in or a year out depending on one's assumptions; but LTE exhaustion is definitely coming. And while one's natural reaction is that 5G will solve global hunger, unfortunately, there won't be enough 5G mobile phones available to eat data capacity in a significant way until about 2023. 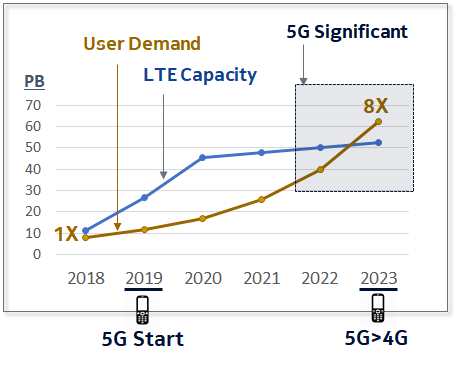 This is illustrated below, where the brown "User Demand" line represents an approximate 50% growth curve and the blue "LTE Capacity" line represents the actual capacity of an LTE network to service that demand (after massive MIMO has been applied). Assuming some headroom will be planned, we can see difficulties starting about 2022 unless 5G is ready and waiting to take over. From the above, were 5G to be deployed in a timely fashion, all would be OK; however, there is not a lot of time. To meet forthcoming demand, we need to get started now, because getting a new technology in the right places at the right time with the requisite capacity-handling capability is no small task: Think in terms of years of preparation, not months. In fact, if we simulate using all the tools mentioned previously, we end up with the following forecast, where the black parts of the histogram represent what 5G would need to supply to avert congestion and, thus, a degraded user experience. However, there is another dirty secret in the closet. The rule of thumb for capacity, as embedded in the 3GPP channel models, is that 80% of traffic originates indoors and 20% outdoors. Compounding that, there is a seasonal aspect to traffic. During the cold winter months in the north, there is even less traffic outdoors (likewise, in the hot summer months in the south). With LTE, indoor traffic is primarily served by outdoor cell sites, booming signals through walls and windows. This begs the question: What happens when 5G needs to handle that indoor traffic? So where does this leave us? There are only two options. The first is to use low or mid-band spectrum outdoors, and blast indoors; the outside-in approach. But in the dense urban case, we are already using that spectrum! So, the only real alternative is new mid-band spectrum. For the moment, none is in sight in the US until about 2020+ when the 3.7-4.2GHz band -- or parts of it -- become available. The other is to deploy mmWave indoors. The problem with going indoors versus using the outdoors-in approach is that everyone wants to get inside. Imagine Verizon, AT&T, Sprint, T-Mobile and all the others showing up at your building and wanting to deploy 5G mmWave inside every room. Perhaps neutral hosting solutions may help. Before we finish, let's dismiss one counter argument. Some will say, "But WiFi will fix that." WiFi, however, has its own growth problems, thank you very much. WiFi demand is also growing, at least at 30% or more, and it too has looming capacity issues, with no significant new spectrum becoming available either. Cellular demand, meanwhile, is separate, independent and additive. So, there is no getting around it. 5G needs to go and bang on some front doors. Now, LTE has many good years left, with a few tricks up its sleeve, but it is aging as a technology and as we all know, it gets harder to run new races as you get old. 5G is the upstart and needs to be deployed quickly to help take over the baton from LTE. But in doing so, it needs to take it over not only outside, but also inside, and knock-knock on some friendly doors. Glad to see Nokia promoting Massive MIMO. It was invented at Bell Labs by Tom Marzetta and is really powerful, especially at 2.3 and above. It looks like a 5X improvement of the common 4x4 MIMO. You're also right on target about inside. At the U.S. Broadband Plan, that was important for public safety. I want to make sure I'm reading this right on a few data points. "Densification unfortunately can result in unwanted interference if applied more so than has already been done in the same frequencies, and so we expect its use to be limited." Others expect substantial densification, especially small cells. So I wanted to check you expect only "limited" use of small cells. In 2017, AT&T and Verizon separately told investors about half of their spectrum was fallow and could be put to work. Obviously, a great deal of Sprint's 2.5 GHz spectrum is not being used. I don't see either factor in your analysis. Is that included? How do you account for the Dish Network spectrum, which is always on the market at the right price? I believe you’ve outlined a number of good reasons why the US carrier market needs to seriously re-evaluate the needs of merging Sprint and T-Mobile US together on the basis of spectrum holdings alone. Perhaps a compromise would be to return part of the “New T-Mobile” Spectrum holdings to Public WiFi use. The other issues surround that 3GPP 5G release hasn’t been finalized yet; and is supposed to introduce 1024 QAM symbol rates. If we’re to accept that in other applications of 1024 QAM, (such as microwave backhaul), each order of magnitude of QAM increases also decreases signal by -3db at the receiver, we’re aqctually looking at a need to re-tune networks to a -9db affecting service at the cell edge. (Increases in QAM create logarithmic degradation; LTE is also QAM-256; 5G is two orders of magnitude increase 3db to the power of 2) . This is a substantial technical hurdle all US Carriers need to overcome; considering cell site leases are generally negotiated to a 20 year (and sometimes longer) terms. Additionally, and to-date, Nokia doesn’t sell hardware to allow anyone except carriers. As you pointed out, data capacity and consumption is in-doors. However, Nokia fails to have a product line which allows an IT department to install equipment themselves. Such a product which adds capacity in government office buildings, schools, hotels, large office buildings where capacity is expected to be consumed doesn’t exist. In fact, this requires carrier-led efforts and large budgets to retain a firm like Crown Castle or SBA, and are often proprietary and carrier-specific. It’s also somewhat disingenuous for Europe-based Nokia to provide favorable vendor financing to European-based Deutsche Telekom and T-Mobile US when the other two US carriers have double the customer base and could utilize new technologies Nokia BellLabs (Formerally Lucent; and once a huge player in CDMA base station technology) is developing to increase spectral efficiency and capacity. I share not only as a Finn, but also as a realist. Swedes and Finns are always very competitive against each other. However, if R&D for wireless networks continue to favor QAM, 6G networks will likely be based on an increase to 2048-QAM symbol rates... 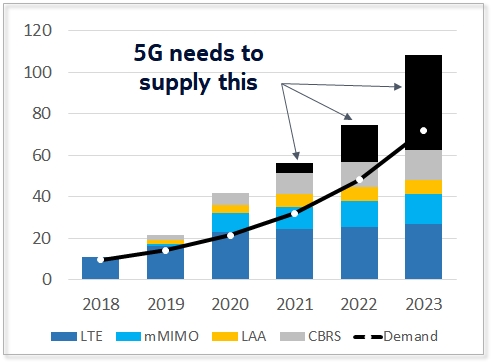 US Carriers need have to start investing into the future, including real estate leases today... including factoring in new propagation modeling which isn’t based on today’s asset portfolios (cell site spacing) or even that required to deliver 5G. These R&D efforts shouldn’t result in a casualty of the US Carrier industry and two (or three) US carriers inability to compete.